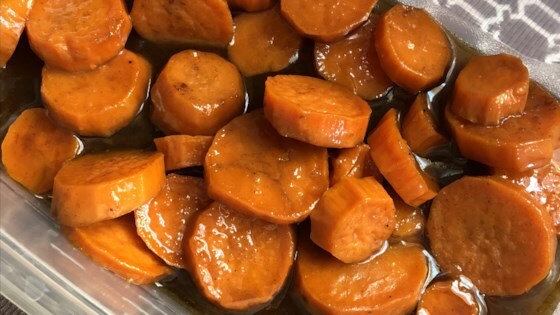 "Traditional sweet potato recipe. It is usually served as a side dish." Mix the sugar, cinnamon, nutmeg and salt. Cover the sweet potatoes with sugar mixture and stir. Cover skillet, reduce heat to low and cook for about 1 hour or until potatoes are "candied". They should be tender but a little hard around the edges. Also the sauce will turn dark. You will need to stir occasionally during the cooking. Stir in the vanilla just before serving. Serve hot. Im orgionaly from Texas and this has been in the family for generations. Try adding 1tblspoon of Brown sugar for every 3 sweetpotatoes used.. it adds a nice warmness to the dish. I found this recipe looking for a new sweet potato recipe for Thanksgiving. Now my family expects me to make this for every holiday!